For the most part, it seems like the Henpire’s just throwing everything they have at us without giving it any thought whatsoever. Some waves are too easy, some waves are too hard. Enemies are often distributed in irregular or random patterns, sometimes they don’t even seem like they belong in a particular wave. 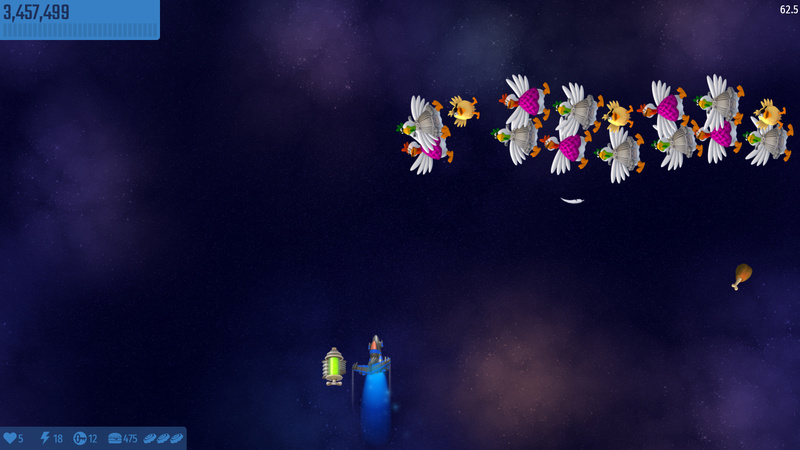 Also, on more difficult missions the game simply gives up at some point and spawns a wave filled with only Chickenauts/Chick Gatling Guns/Egg Ship Chickens, which is usually impossible to beat without dying or using superweapons. Some waves are simply unbalanced because either they have too many enemies or the enemies that spawn in them are way too strong (for example, the Chick Gatling Guns in the Technological Advances wave). Basically, the RNG has way too much freedom right now. There have to be limits on how many times a certain enemy type can appear in a wave, and in what positions it can appear depending on the difficulty. While it’s fine that we’ll have some harder waves, this doesn’t feel like the right way. 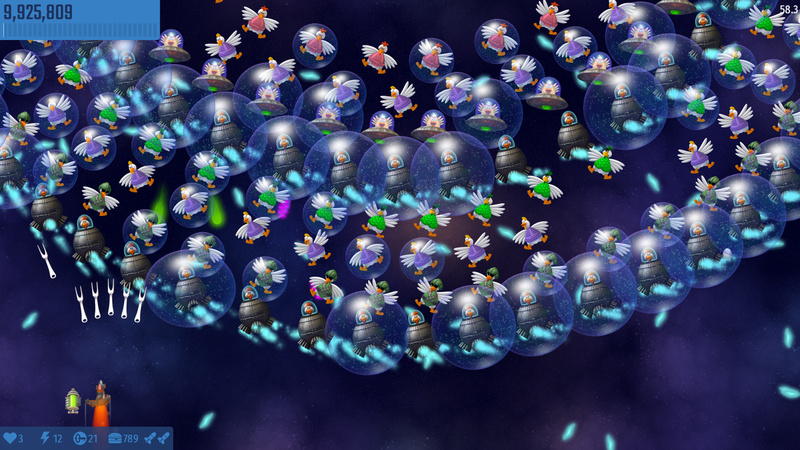 For example, with the Technological Advances wave, on higher difficulties you could increase the number of UFO Chicks, replace them with UFO Chickens, or maybe have both types of enemies spawn. You could also tweak how often they can attack. 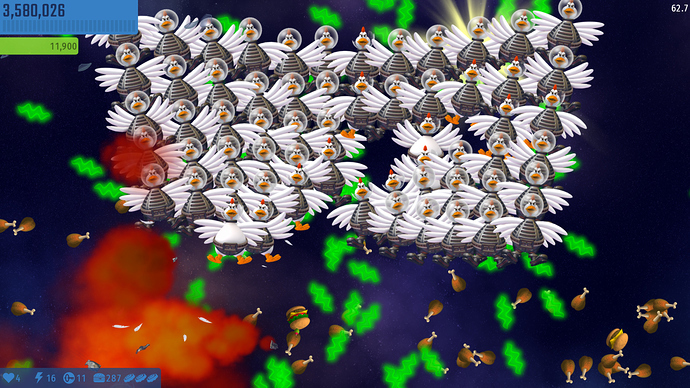 Instead of just letting the RNG spawn enemies clearly too strong for the wave. I know you’re aware of most of these problems but I just wanted to point them out. The bosses keep their health values from the episodes. The only bosses that will have their health values changed are The Egg Cannon and Henterprise, which will be nerfed down to 750000hp (though imo the first U.C.O should also be buffed to 30000). 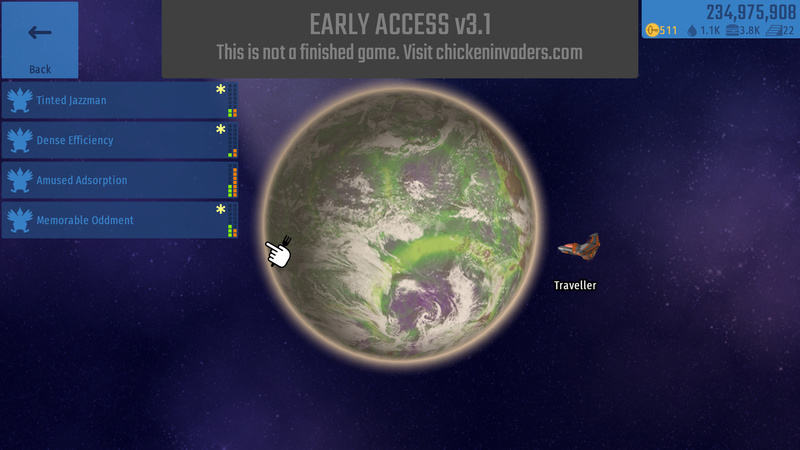 If the exact same boss is encountered more than once in the episode (so basically the Sweater Chicken and Henterprise), only the last one should be included. Different variants of the same boss are fine (like the U.C.O.s or the Space Crabs). That’s not really a necessity, I just don’t think we need to have more than one encounter with a boss. (I don’t know how exactly this works currently, so I apologise if something like this is already implemented.) Each one of the eight mission difficulties is given a pool, which contains bosses within a certain health range (though they can be moved to different pools if they’re considered to be too easy or hard). Along with it, the mission can also take bosses from adjacent difficulties (so a difficulty 4 mission can also take bosses from difficulties 3 and 5), to make sure bosses don’t repeat too often. 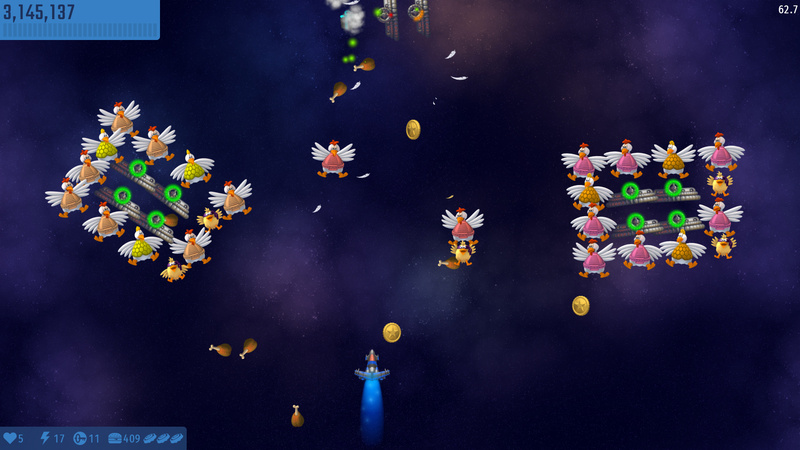 Currently weapon upgrades are rather simple: each level increases the starting firepower by 1 (and up to 8). However, I’d say that makes them a bit too strong for the easier missions. This would be especially noticable after the Revenge of the Yolk bosses are added, since a lot of the early ones are rather weak compared to their counterparts from the 2 later episodes. Instead, I’d like to propose the following weapon upgrade system. There will be 8 upgrades just like now, but they’ll be split into 3 types. Starting firepower. There will be 3 of them, each next one with an increasing price tag. This will bring the maximum starting firepower of a weapon down to 3. To make these upgrades useful on higher difficulty missions too, the charity bonus should disregard these upgrades and treat the player as if they still started with 0. Damage modifier. There will be 4 of them, each with an increasing price tag. The modifiers will be x1.10, x1.15, x1.20 and x1.25. A unique, weapon-specific upgrade. This is the most expensive upgrade, which should cost about 50% of the stock weapon’s price. It affects each weapon differently. For example, the Lightning Fryer could have an increase in rate of fire over time, the Corn Shotgun’s pellets could pop after travelling a certain distance, increasing damage at longer ranges etc. This levels are not hard You need more skills. I face this levels and reached it with only 2 lives lost. You wanted it hard now IA give you hard. The bosses need buff and new atacks. But that literally proves what he said: “usually impossible to beat without dying or using superweapons.”. He can buy shockwave capacitor to block enemy atacks. Its like defend mini bomb. Either way, they’re annoying. It’s possible to design a difficult and challenging wave without just throwing the toughest enemies at the player in large quantities. I dont know about you guys. For me this levels are very good and hard, they make me laugh so much! They are hard,but not good,considering the amount of RNG some of them require. Look, @Orandza and @GgWw1175, I don’t know about you guys, but when I play games I ſometimes want a challenge. The way the game is ſet up, you can chooſe not to do miſſions you don’t like. If you quite during the firﬅ wave, you can even change your mind. At the end of the day, there are plenty of eaſiër miſſions if prefer flyïng miſſions that you can ſurvive. I think that, if anything, an additional (harder) level ſhould be added, but I don’t ſee why the miſſions ſhould all become eaſiër. Please don’t ask them to nerf waves or we will we get another kid friendly chicken invaders 5 like game with no challenge at all. @Nikito is right, it’s fun this way. Unfortunately, the only factor that currently determines whether a wave is hard or not is RNG. It’s not skill that decides if you can beat the mission, it’s luck. As much as it would take more effort, I’d argue that adding new more complex waves or more complex variants of existing waves would be better than just letting the RNG do whatever it wants. Hell, add some more dangerous enemies. Just don’t spam them all over the place. For whatever reason you think that I want all the missions to be made easy. Frankly, I just want them to be fair. If I die, I want to be sure that it was my fault and my fault only. Not RNG’s. RNG decides the difficulty of a miſſion, but then you have forewarning that the miſſion is difficult via the nice little indicators that accompany the name of the miſſion in the galaxy view. At that point you can chooſe whether to fly the difficult miſſion or not. If you chooſe to fly, it is moﬅly your skill that determines what happens as you reſpond to the RNG that controls eggs &c.
Exactly! That’s the bad part! The fact that the RNG decides the difficulty! If I wanted to be firing at dozens of bullet sponges while dodging dozens of projectiles I’d be playing bullet hell games and not this, but that’s besides the point. I’d like to point out that those waves are literally the only difficult ones in the game. So at this point there are no “difficult missions” to speak of, because all that makes them “difficult” is a chance to get screwed over by the RNG. It decides it BEFORE you decide to go on the miſſion! It’s very ſimple: if you don’t want a hard miſſion, don’t go on it. And @GgWw1175, if you had perfect play, your argument would have a lot more value, but as you’re not as far as a know, from my point of view, it ſeems like you’re blaming your miſtakes on RNG. Juﬅ to make ſure we’re on the ſame page, the orange bar on the miſſion deſcription is the difficulty, the green is the length, and the aﬅerisk means that you haven’t flown that miſſion before. If you want ſhort and eaſy, pick “Denſe Efficiency”. If you want longer and harder, chooſe “Amuſed Adſorption”. I do want a hard mission,but not an RNG-based one. Sometimes,I enter a hard mission,and I don’t really get anything too bad. 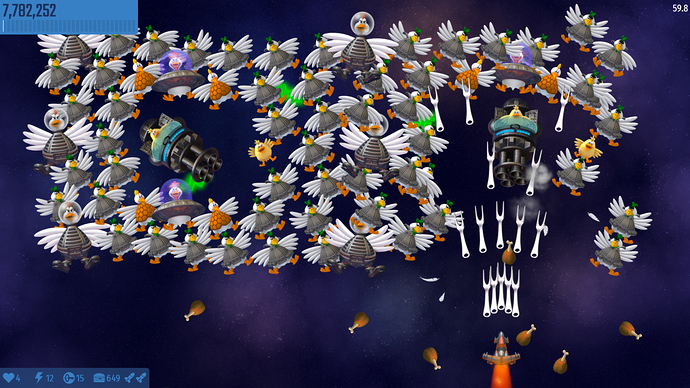 Other times,I get shape shifter with egg-ship chickens or chicken roulette with chick gatling guns. And that’s certainly not something I can predict before a mission. The whole point is,it shouldn’t require too much RNG. You’re literally just letting the game to decide your fate. Sure,you can see how much the difficulty bar is filled,but you can’t know whether or not luck is going to be on your side. Argh! There’s a bug in the mission generation code that will create missions up to 40% harder than it should. This pushes the difficulty outside the normal bounds, and the RNG is doing its best to make things more difficult by spamming mini-bosses. The missions on the screenshots are pure deathtraps – it’s a wonder people are still trying to politely suggest that perhaps difficulty is a tad too much and don’t instead pick up their pitchforks and try to kill me in my sleep. And I find it even more amazing that there are players out there that take this in their stride, like it’s no big thing, eh, we’ll manage. You guys are heroes! Anyway, in the next update the difficulty will indeed be scaled back to fit inside its expected operating range. HOWEVER you difficulty freaks should not despair, because skills are being reworked and will probably change from controlling enemy health to boosting mission difficulty. So it will still be possible to boost difficulties past their limits and get these types of insane missions (you’ll just need to void your warranty by explicitly choosing it). I got the chicken roulette with Gatling guns too! That was awſome! So the epic waves were just a bug all along? Blimey! Glad to hear that wasn’t intentional.